Hannah Hoehne took 1st, Zac Hannenberg 2nd, and Kiley Bolton finished 3rd in Architectural Rendering in the 2018 American Design Drafting Association National CAD Design Contest. Lisa Miller took 1st, Gabriel Paulin took 2nd and Brandon Elbert 3rd in Architectural Residential Design Drafting in the 2018 American Design Drafting Association National CAD Design Contest. The Technical Illustrated Mechanical category was won by Tyler Hunt, with Kreath Johnson taking 2nd and William Bauchem 3rd in the 2018 American Design Drafting Association National CAD Design Contest. The Machine and Mechanical Working Drawing category in the 2018 American Design Drafting Association National CAD Design Contest was won by Cameron Schindhette with Beau Pfalzgraff taking 2nd and Lance Johnson 3rd. 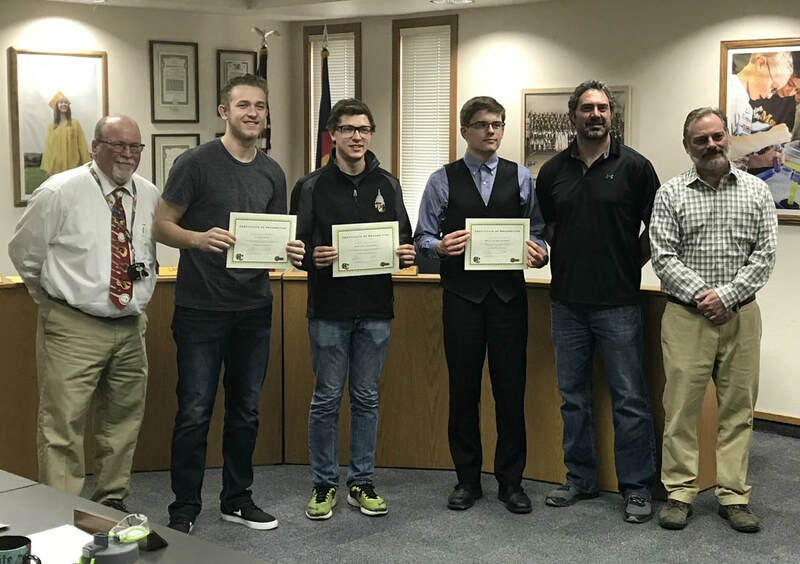 On Monday evening Cañon City High School students were honored for their performance in the 2018 American Design Drafting Association National CAD Design Contest. Once again CCHS students swept all the categories they entered! CCHS swept the national poster competition with Lisa Miller taking 1st, Tyler Hunt and Brandon Elbert 2nd, and Hannah Hoehne taking 3rd. Architectural Rendering was won by Hannah Hoehne in 1st, Zac Hannenberg 2nd, and Kiley Bolton finishing 3rd. The Architectural Residential Design Drafting contest was won by Lisa Miller, with Gabriel Paulin taking 2nd, and Brandon Elbert 3rd. The Technical Illustrated Mechanical contest was won by Tyler Hunt, with Kreath Johnson taking 2nd, and William Bauchem 3rd. Finally, the Machine and Mechanical Working Drawing category was won by Cameron Schindhette with Beau Pfalzgraff taking 2nd, and Lance Johnson 3rd. These students were guided by Mr. Scott Smith who is in his first year as our full-time ADDA instructor. Congratulations! The Fremont County Workforce Learning Board, coordinated by Lisa Tedesko, is in the process of collecting donations for its scholarship fund. Individuals and businesses that see value in our expanded intern and apprentice program can help out by making a tax-deductible donation to the fund. All dollars collected are used to award scholarships to Cañon City and Florence High School students who have successfully completed internships. Scholarship amounts are based on internship quarters completed. These will be awarded to student interns at a May 9th Fremont County Career Connections Celebration Banquet. I want to thank Lisa for the great work she is doing setting up these opportunities for our students and finding such a creative way to reward them for their hard work. 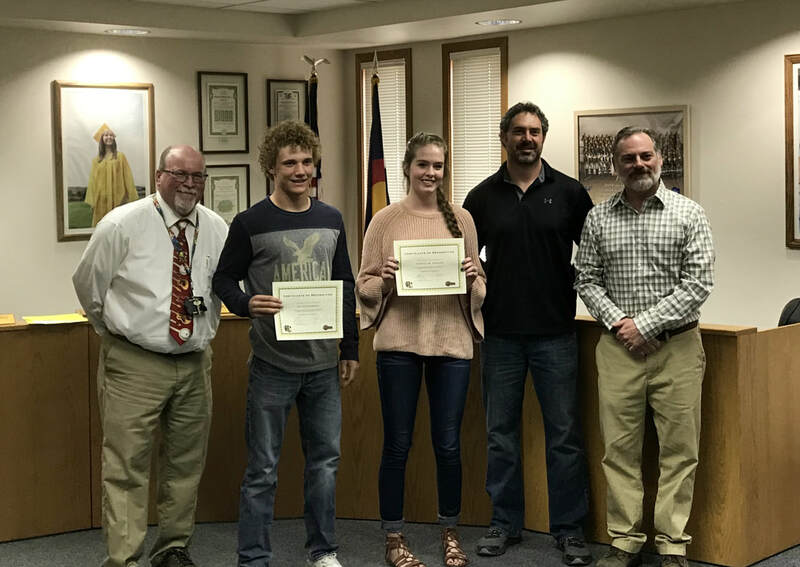 Cañon City High School swept the national poster competition with Lisa Miller taking 1st, Tyler Hunt and Brandon Elbert 2nd, and Hannah Hoehne taking 3rd. Scott Smith guided them to this accomplishment. Last week I completed four principal evaluations and this week I hope to wrap up the last three. This is an annual process that leads to my making a recommendation to the Board of Education regarding the future employment of each principal. Last Monday our Board of Education heard public input about a proposal to move the daily high school start time to an hour later next year. This is being considered because of the many studies conducted about adolescent sleep patterns showing this could improve attendance, behavior, and academic performance. As a result of comments heard in person and sent to board members by regular and electronic mail, I was asked to work with our transportation department to see if we could accomplish the following: 1. Create a model that allows McKinley Elementary students to arrive at school no earlier than they do right now (8:40 AM). 2. Create a model that allows Harrison K-8 students to arrive at the school close to the current time they begin. 3. Create a model that maintains the ability of our transportation department to fill driving positions by keeping routes at an appropriate length. On Wednesday I met with Director of Operations Jeff Peterson and the entire transportation staff and we were able to create a transportation schedule that met these requirements, and so the Board will be considering this at its April 9th meeting. Cañon City High School staff are in the midst of taking online coursework aimed at preparing them for when all grade 9-12 students receive Chromebooks next fall. This week we also worked on policies regarding student responsibilities with devices, and began conversations about which computers currently located at Cañon City High School will need to remain there next year. This is the latest draft of a proposed transportation schedule that may meet the requirements of the board of education. Harrison's start times are not yet listed because their Building Leadership Team is considering several options around how to start their school day. Last week we worked to finalize our design-build contracts with GE-Johnson and RTA Architecture. We also had RLH Engineering folks on site to conduct asbestos sampling related to our Multi-Facility Repair Project. Those samples went to a lab for testing and RLH is completing drawings that show asbestos locations and quantities. This will lead to a plan to efficiently remove windows and doors that will be replaced on several of our buildings. RLH Engineering is also helping build a finalized Master Budget for our Multi-Facility Project. On another front, the CDE Capital Construction Department asked for clarifying information on each of our new school grants. I have already answered follow-up questions about our Washington Elementary project, and am just waiting on some information from our architects before I submit answers to CCMS follow-up questions. Last week I conducted four principal evaluations. I also attended a meeting with Valley-Wide Health Services representatives to learn about a mobile doctor and dentist program that could benefit homeless and needy students. I also attended a board meeting and work session, a Superintendent's Advisory Council meeting, and a podcast interview with Lindamood-Bell representatives. I spent Tuesday afternoon in an instructional leader Professional Learning Community session. Later in the week, I had some parent meetings and time set aside to work on unfinished principal evaluations. On Friday I attended a School Safety Town Hall planning meeting. The Town Hall will take place on Monday April 9th at 7 PMin the district board room. This week I travel to Denver and back on Monday to attend the Opportunity Coalition day at the capitol. This coincides with the first committee hearing of the revised finance formula proposed by superintendents. On Tuesday afternoon I'll be back in Denver for the Colorado Safe Schools Resource Center advisory board meeting. Wednesday brings central office and operations staff meetings, plus a special board work session. I also have evaluation meetings with three of our principals from Wednesday through Friday.